The Starship is a unique new centerpiece lighting fixture that is ideal for creating impact at the heart of a lightshow. 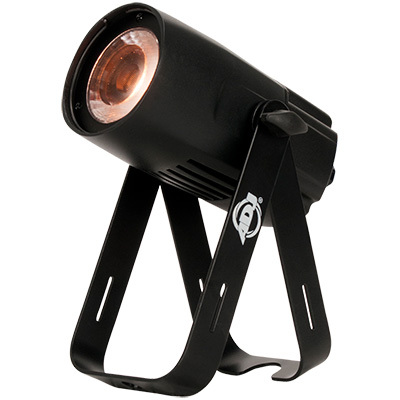 It features six bars which each extend out from a central hub and are loaded with four 15W RGBW LEDs. Each of the bars has an independent motorized tilt function and all 24 of the LEDs can be controlled individually. This allows for the creation of a wide variety of exciting effects that feature a myriad of razor-sharp beams changing color and moving in different directions. Expanding ADJ’s Entour Series of professional atmospheric effect generators, the new Entour Faze Jr is an extremely portable and affordable unit that features a 200W heater and 3-litre fluid tank. It generates ‘faze’ by using standard water-based fog fluid but dissipated using a high-power fan to create a haze-like effect that is ideal for enhancing the beams of a lightshow. Ideal for mobile DJs, the Starbar Wash is a complete four-head LED wash system that is supplied complete with a tripod stand, footswitch and protective bag. 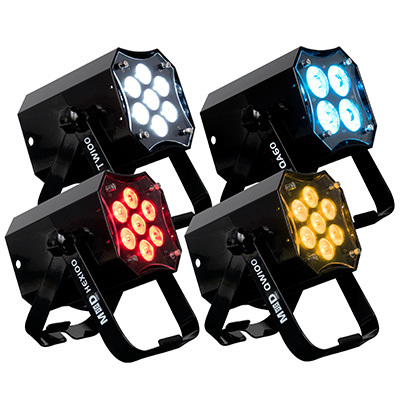 Each of its four par fixtures feature four 4W 4-in-1 RGBW LEDs and has a 25-degree beam angle that is ideal for illuminating either a stage or dancefloor. All four pars are pre-wired into the T-bar, which means only one power and DMX connection is required. Having previously been distributed by sister company Elation Professional as the 4Cast DMX Bridge, NAMM 2019 will see the launch of the 4 Stream DMX Bridge under the ADJ brand. The next step up from ADJ’s popular Airstream DMX Bridge, the 4 Stream DMX Bridge is a 4-universe wireless device that seamlessly bridges WiFi, Art-Net, sACN and WiFLY (ADJ’s wireless DMX solution) signals to wirelessly control DMX devices. 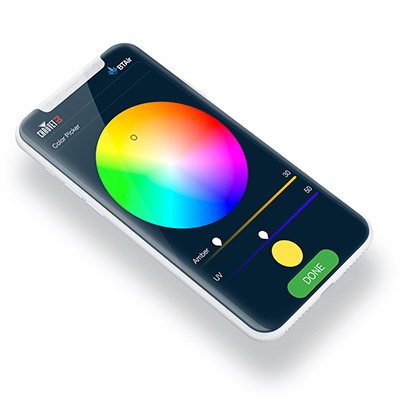 It allows lighting control direct from an iPad tablet using the 4 Stream DMX Bridge APP, which puts powerful scene programming tools at a DJ’s finger tips. Building on the success of the Airstream Wifi Pack, the new Airstream Wifi Bar from ADJ is a wireless switch pack built into a lighting T-bar which can be controlled from the existing Airsteam Wifi iPhone or iPad App. Featuring a solid metal construction and four fixing points for lighting fixtures, the unit has a central mounting point which allows it fit to the top – or part way down – a standard tripod stand. 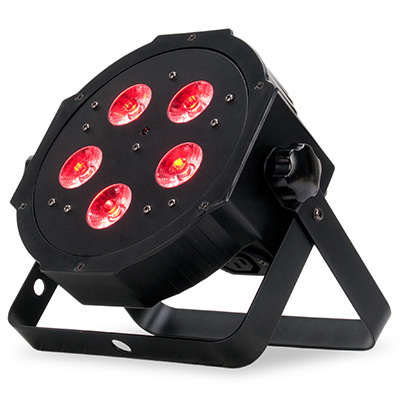 Expanding ADJ’s Startec Series of affordable high-impact lighting fixtures, the new Rayzer brings together two high-octane effects in one compact and easily portable unit. It combines a tri-colour laser projector with a multi-zone RGB wash effect, which allows this one fixture to generate piercing mid-air beam effects for those ‘reach for the sky’ moments as well as vibrant washes that will fill a dancefloor with richly-saturated swathes of colour. Another new addition to the Startec Series, the Contour is a compact lighting effect fixture that will make a big impact. The LED-powered unit blasts out a myriad of multi-coloured beams that spread out over a wide area, making it ideal for filling any venue with vibrant colour and energetic movement. 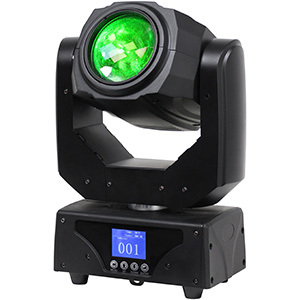 Powered by 27 x 1.5W 3-in-1 RGB LEDs, which shine through 36 individual lenses, the output is similar to the classic ‘fan style’ effect. Each lens projects a line of bright light dots which move and change colour to create an ever-changing lightshow.